With a retro styling and selfie-first design, the pink X-A3 Mirrorless Digital Camera with 16-50mm Lens from Fujifilm will be a ton of fun for photographers. 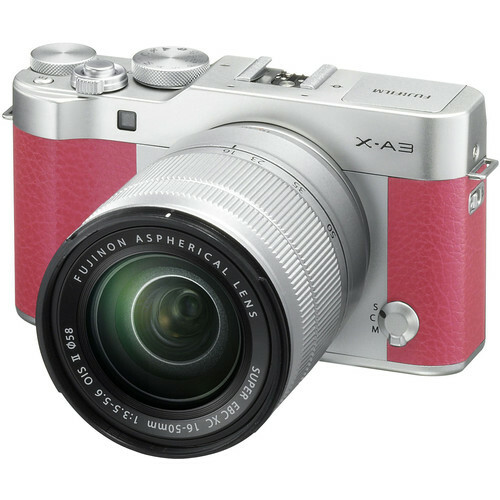 The X-A3 incorporates a newly developed 24.2MP APS-C CMOS sensor that can create sharp, detailed images at sensitivities up to ISO 25600 and continuous shooting speeds of up to 6 fps. An electronic shutter option is now available as well, allowing for shutter speeds up to an incredible 1/32000 second. In addition to stills, the X-A3 even offers Full HD video at up to 60 fps. Addtionally, in creating a selfie-ready tool, the X-A3 has a touchscreen LCD that can tilt up to 180° and uses a slide-and-tilt mechanism to ensure 100% visibility as you shoot. The touchscreen also provides added functionality with Touch AF, Touch Shoot, and other controls.